PLAINVILLE - While Bristol was cruising, things went from bad to worse for the Plainville Legion team. Bristol beat Plainville 12-0 on Monday in a mercy rule-shortened six innings at Trumbull Park. Bristol moved to 12-5 on the season, still with two games left, while Plainville finished its season 4-14 overall and dropped eight of its final nine games. Bristol held just a 3-0 lead through five innings, but then the flood gates opened. In the top of the sixth, the team plated nine runs on six hits to take complete control of the game. Anthony Lozier set the tone at the top of the Bristol lineup. The left fielder had four hits, all of them singles, drove in two runs and scored another in the game. In all, eight different Bristol hitters reached base multiple times in the games. 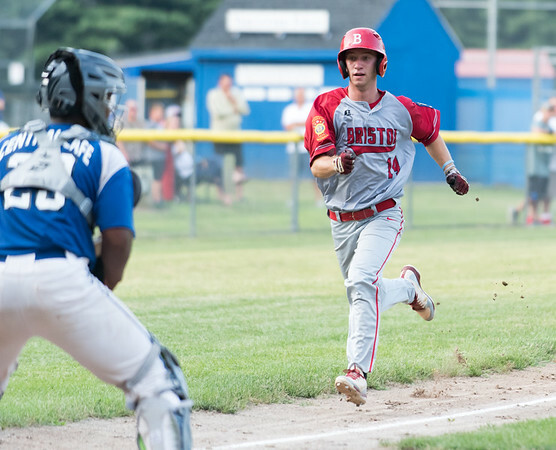 Much of Bristol’s offensive onslaught was a result of Plainville struggles on the mound. Alec Karal started on the mound for Plainville and struggled with command throughout the outing. In 3⅔ innings, Karal gave up just two earned runs, but walked seven batters and surrendered four hits. On the other side, Plainville was unable to get anything going against Bristol’s Stephen Warkoski. In a complete game, Warkoski struck out 10 batters while giving up just three hits. One Plainville hitter who did have some success was Ryan Rodriguez, who reached base each of his two times at the plate. He saw it as a great chance to get bragging rights over Warkoski, a good friend of Rodriguez, being that they are both from Bristol Central High School. Though Plainville’s record doesn’t show much to be proud of, McCarthy was still happy with the way his team played this season. Bristol head coach Jerry LaPenta isn’t worried about seeding, as his team currently holds the second spot in Zone 1. Posted in New Britain Herald, Plainville on Monday, 16 July 2018 21:37. Updated: Monday, 16 July 2018 21:40.